Online teens enjoy new opportunities to create, remix, and share digital content. Thanks to the internet, American teenagers can engage media material and create their own content in ways their parents could not. Today’s online teens live in a world filled with self-authored, customized, and on-demand content, much of which is easily replicated, manipulated, and redistributable. The internet and digital publishing technologies have given them the tools to create, remix, and share content on a scale that had previously only been accessible to the professional gatekeepers of broadcast, print, and recorded media outlets. Frequent internet use is the norm among teenagers ages 12-17 in the U.S. Some 21 million teens (those ages 12-17) use the internet and half of them use the internet daily and another third use it once a week or more. Parents of online teens view the internet and email as a positive addition to their children’s lives and teens are often the ones leading the technology adoption curve in their households. At the edge of this curve are “content-creation” activities such as blogging, file-sharing, and creating original content to post online, all of which are considerably more common practices among teens than among adults. Content Creators are online teens who have created or worked on a blog or webpage, shared original creative content, or remixed content they found online into a new creation. There is little demographic variation between content creators and other online teens. Content Creators are more likely to have broadband internet access at home, which dovetails with previous Pew Internet Project research showing that adult broadband users are more likely than dial-up users to create content.7 While 54% of Content Creator teens have broadband at home, 46% of other online teens report high-speed home access. And in a pattern that we see repeated in nearly all content-creating activities, teens who report going online more often are much more likely to report content-creating behavior. Urban, highly wired teens are more likely to share original artistic content. In the age of digital media, the possibilities for the manipulation of text, images, video, and audio files have increased dramatically. Teens and adults alike have embraced the ability to gather, chop, blend, and re-blend content to create new expressive materials. 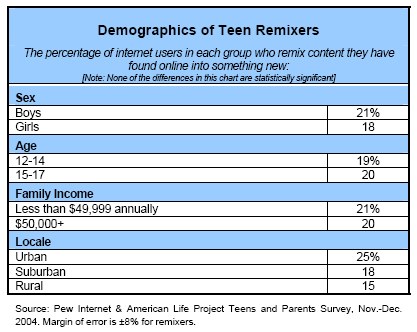 Teens are also taking advantage of the opportunities that the internet offers for publishing and sharing new creations or remixes. Younger Americans have grown up in a world of media forms that allow them to participate in the production as well as consumption of content, by allowing teens to create and share their own digital material. One of the elements of our definition of media making is the sharing online of self-authored content. Overall, one-third (33%) of online teens report sharing their own artwork, photos, stories, or videos with others via the internet. There is some demographic variation in the population of teens who make and share their own media creations. Artistic Content Creators are slightly more likely to report living in urban areas; 40% of urban teens who use the internet say they create their own content, compared with 28% of suburban teens and 34% of rural teens. Broadband access at home is also associated with the act of sharing of self-created content—more than a third (36%) of teen broadband users have shared original work they made themselves, while 28% of dial up users have done so. 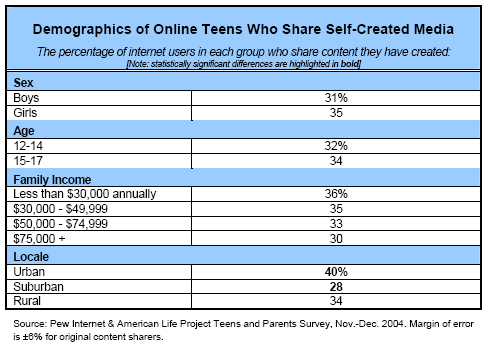 In addition, those who use the internet frequently are more likely than less frequent internet users to create and share their own content About two out of five (39%) daily internet users report sharing self-authored media, compared with about one in four (24%) of teens who go online several times a week. When it comes to sharing self-authored creative content, older girls stand out. While boys generally dominate downloading and file-sharing activity online, the act of creating and sharing self-authored content, such as artwork, photos, stories, or videos, is one arena where older girls lead. Just 29% of boys ages 15-17 share their own creative content online, compared with 38% of girls in that age group. Like adults, some teens use content they find online as a palette for personal expression. Content remixing is equally prevalent across genders, ages, and socio­economic groups. Surprisingly, dial-up and broadband teens remix at comparable levels, but teens who use the internet daily are more likely to mash and mix content than those who go online less than once per week. One in five online teens keeps a blog and 38% read them. One in five online teens (19%), or roughly 4 million young Americans, have created their own blog. Blogs are a type of webpage, typically maintained with software that allows internet users to easily post material to the page, usually displaying content in reverse chronological order with the newest items at the top of the page. For many online teens, blogs function as a personal (yet often publicly displayed) online journal that can be used as a forum for exchanges with friends, posting ideas, sharing personal experiences, and other content. Blogs are often authored with select audiences in mind, and millions of teens are reading them—38% of all online teens, or about 8 million young people, say they read blogs. Teens surpass adults in blog keeping and reading. Older girls are most likely to blog. As with other online communication activities, older girls again lead the charge into blogging in the teen cohort. A quarter (25%) of online girls ages 15-17 blog, compared with 15% of online boys of the same age. About 18% of younger teens of both sexes blog. Teens who go online frequently are also more likely to blog; 27% of daily users keep blogs, compared with 11% of those who go online several times a week and 10% of those who go online less often. Bloggers are tech-savvy and intrepid internet explorers. Bloggers and to a lesser extent teens who read blogs are internet omnivores who explore, play with, utilize and generally inhabit the internet with a greater abandon than their less blog-savvy counterparts.. They help adults do things online. They have more technological tools such as cell phones and PDAs and are more likely to use them to go online. Not only do they live in technologically rich households, but they are more likely to have their own computer at home and to be able to use it in a private space. Most strikingly, they have more experience with almost all online activities that we have asked about. Blogging teens are more likely to have helped an adult do something online than non-blogging teens, this despite living in households with generally more tech-savvy parents. More than nine in ten, or (94%) of blogging teens report helping an adult do something online that they could not do themselves, while 79% of other teens report rendering similar assistance to an adult. Teen bloggers are also more likely to have other technology than their non-blogging counterparts. Teen bloggers are more likely than non-bloggers to have a laptop computer (23% vs. 13%), a cellular phone (55% vs. 46%), and a personal digital assistant like a Palm Pilot, Sidekick, or Blackberry (13% vs. 6%.) 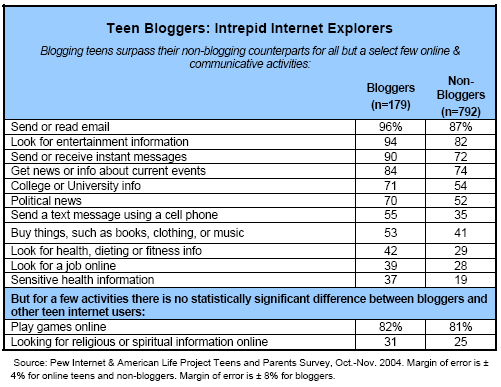 Regular teens and bloggers are equally as likely to have a desktop computer at home. Teen bloggers are also more likely to have home access from a private space in the home, with a third of bloggers (33%) reporting access from a private room, like a bedroom. In comparison, one-quarter of non-blogging teens have access from a private place. Blog readers are more prevalent in highly wired and high-income homes. 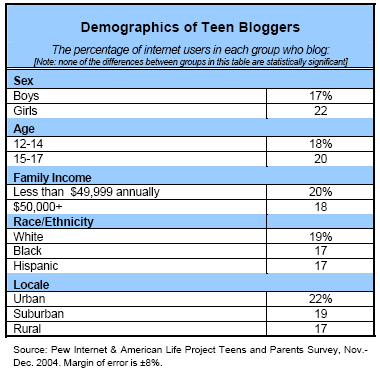 Among teens who read blogs there are significant demographic differences from the overall online teen population. Teens from households with higher incomes ($50,000 and up) and higher levels of parental education are more likely to read blogs than teens from low socioeconomic status homes. About 42% of teens in households earning more than $50,000 annually report reading the blogs of others, compared with less than a third (30%) of teens from lower income households. Teens from tech-savvy and highly wired homes are also more likely to read blogs than their less wired compatriots. More than two in five (42%) teens with long-wired parents—those parents who have been online for 6 or more years—read blogs, in contrast to the one-quarter (25%) of teens with parents who have been online for less than four years. Broadband internet access also appears to be related to blog reading—46% of online teens with broadband at home read the blogs of others, while only 31% of dial-up users say the same. Girls are more likely than boys of similar ages to read the blogs of others. More than half (53%) of girls ages 15 to 17 read blogs, compared with 34% of boys in that age group. Fewer young teens read blogs compared with their older counterparts overall, with 31% of all 12- to 14-year-olds reporting blog reading, compared with 43% of teens ages 15 to 17. Daily internet users are the most likely to read blogs, followed by those online several times a week. Infrequent internet users are the least likely to report ever having read a blog. Half of daily users report blog reading, while 30% of teens who go online several times a week read blogs, compared with just 11% of infrequent teen users. Teens who report that they most often go online from home are also more likely to read blogs than those who favor other internet access locations. While 43% of these home users read blogs, 29% of teens who go online most often from school say that they read them. Blog readers tend to be more intense users of the internet than non-readers. They are less likely to have done most activities than bloggers, but more likely than non-readers to report having ever tried all online activities on our survey, with the exception of online gaming. All groups, bloggers, readers, and other internet users, report playing online games at the same levels. More than half of teen bloggers update once a week or more. How frequently are teens updating their blogs? More than half (57%) of teen bloggers update their blogs once a week or more, and nearly three in ten (29%) update at least three times a week. Drilling down into the data, we find a small, dedicated group of bloggers who update their blogs quite frequently—13% of teens post daily or more often and 16% of blogging teens update about 3 to 5 days a week. Close to another third (28%) say that they update their blogs once or twice a week. Another quarter update their blog every few weeks, and about 18% of teen bloggers post to their site less than that. Given that the average teen’s blog is not updated particularly frequently, it is not all that surprising that teens do not read blogs routinely, either. About 15% of online teen blog readers say they read once a day or more often. Another 15% say they read blogs 3 to 5 days a week, and 17% say they read 1 or 2 days a week. One in five teens who read blogs say they read them every few weeks and a third report reading them less often. All in all, nearly half of blog-reading teens are reading them less than once a week, and the other half weekly or more often. Blog reading usually stays within a teen’s personal network. Teen bloggers blog for an audience of friends and peers and spend more time reading blogs in their friend network than outside of it. Many community-oriented blogging sites such as Live Journal report a user base that is heavily skewed towards younger users,10 providing a medium for and active display of the intertwining of blogging, community and relationship-building among teens. Bloggers manipulate content by sharing and remixing. As mentioned previously, 19% of online teens, or about 4 million youth, report remixing content gathered from other sources into a new creation and a third (33%) report sharing original or remixed content with others online. Blogging teens are more enthus­iastic content creators, manip­ulators, and sharers than their non-blogging brethren. 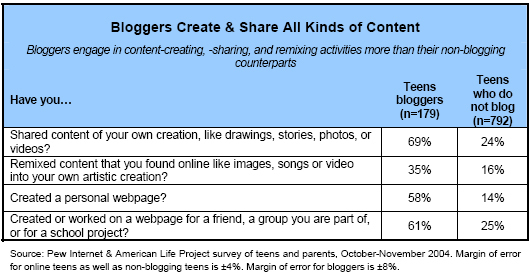 Teens who blog are more than twice as likely as non-bloggers to share content online of their own creation and to remix content that they have found elsewhere into something new. Close to seven in ten (69%) blogging teens have shared something online that they created themselves, such as artwork, photos, stories, or videos. By contrast, fewer than a quarter (24%) of non-bloggers has done the same. More than a third (35%) of teen bloggers have taken content they found online such as songs, text, or images and remixed it into their own artistic creation. Only 16% of non-bloggers report similar remixing activities. Blog readers are also more fervent users of the web than other teens, though less so than blog authors. Half of all teen blog readers (50%) report sharing something online that they created themselves, such as a story, artwork, photos, or videos. By way of comparison, only about a quarter (23%) of non-readers report similar sharing of creative works. Blog readers are also a bit more likely than non-readers to have ever remixed content online. About a quarter of blog readers (26%) say they have taken content that they have grabbed elsewhere and remixed it into a new artistic creation, while only 16% of those who do not read blogs report the same. Teens also create and maintain websites for others. A fifth of online teens (22%) report keeping their own webpages, which is similar to the 24% of online teens who reported creating or working on their own webpage in our 2000 survey of teens and parents.11 However, the growth of the overall online teen population means that the number of teens involved with creating or maintaining webpages has grown from about 4 million to about 5 million. Though technically blogs are a type of webpage, webpages generally tend to be more static, with less frequently updated content. Blogs, particularly those created through blog hosting web services, usually use templates to organize and simplify layout designs. Websites typically have more free-form layouts. A slightly larger group of online teens (32%) say that they have created or worked on webpages or blogs for others, including groups they belong to or friends, or for school assignments. Daily internet users are more likely than less frequent users to have built a personal webpage (31% vs. 12%), and more likely to have created a page for others. The differences in creating websites for others are less extreme, with 36% of daily users creating sites for others compared with 27% of less frequent users, though these differences are still statistically significant.